Are you after the Morris ? If so I'll post you some info by PM, if not I'll post it here. P.S. - BTW, if you're after her, then I'll think you already have the info. No, I am not looking at Morris. I would be interested in any information on her though. No, I am not looking at Morris. - I would be interested in any information on her though. When you mentioned in post #33 the below quoted, I've remembered the double non original stacks as shown on her in the first post #12 picture . . . I had some information that the Morris had been re-powered w/ 2 Cummins KTAs at 575 hp max, consuming ~22 GPH @ 10 knots w/ generators running. A shame. Still quite a pretty little ship. Where is she being advertised for sale? I read that she had a two million dollar overhaul. Seams to be a rather small ship to put two million dollars into. The folks that gave the Scouts the two might be a bit peeved about it being sold so soon. Is that what they are asking for the boat? The two million dollar overhaul you heard about is the money spent by her long-term benefactor, Bob French, over the years, particularly including a long overhaul in 2000 in which lots of metal was replaced and the entire vessel was blasted and coated in epoxy. Time is catching up with Bob, and he recently passed her along to another scout group, who weren't big enough to make use of a boat that size. She'll be offered in Boats & Harbors, and I'm told the asking price will be US $ 350,000. This past weekend she sailed under her own power from Sacramento to Rio Vista, where she will be shown to prospective buyers. She's presently (Feb 2018) being offered in Boats and Harbors for US $ 110,000. So maybe it could be at present she's only in need of an urgent paint job, and adding some kind of stabilization if a comfortable sea motion is desired, plus some deep pockets for future maintenance, and to pay for the fuel on long travels . .
Good luck SD, please keep us posted . .
P.S. 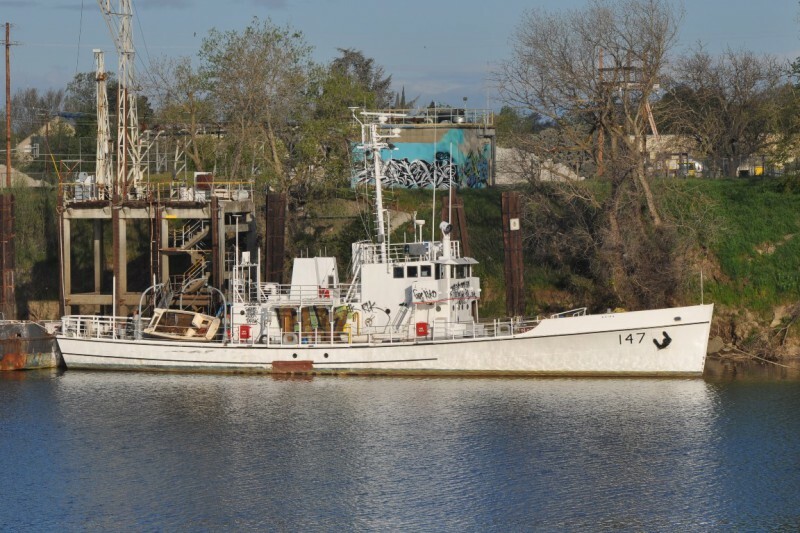 - Below she's shown as the West Sacramento Sea Scout Ship Morris 147 . . . (showing her new stacks) . . . I hadn't realized Morris was for sale so recently. Thought she had been sold for $270,000 in 2016, but not firm knowledge. Didn't see her listed there now. I had seen some info on refit. Would love to know if they were able to reclaim the space of fiddly deck (upper half of engine room) when they re-powered her. Great picture you found, BTW. Separately, these boats actually had dual stacks as originally built. Or more like just exhaust pipes on either side. The center funnels were fitted to most boats during re-power jobs in late 1930s, I believe. Early configuration, exhaust stacks behind windjammer type vents. Also carried 2 masts at that time. The last above picture shows the Tiger WSC-152 patrolling off the Naval Air Station Barbers Point (John Rodgers Field) on O'ahu, on Dec 7, 1941. She was sold in 1948. Some more uploads by Ken Laesser, the poster of the above video. Thank you for the information and for identifying the photos! My wife and I are actually looking at the Morris. I have contacted both the current owner and the broker about her. down to 9'6''. A little deep for where we want to park her as the average depth of the Tennessee river is 9 feet. I'm hoping to adjust ballast to up the draft without removing any,, however, that may not be possible. I read "Rum-runners, U-boats,and Hurricanes" by Brian Galecki which tells quite a bit of the history of these ships. they were originally ballasted with I think 5-8 tons of pig iron to keep them from being top-heavy. The USCG removed that and several other items to up the speed. After the Bledoe and Jackson sank in a hurricane they made several other changes to stabilize these ships. The Morris is in very good shape for her age and has been heavily renovated(although for the Sea Scouts). I hope to go aboard soon. Call me crazy or even foolish. If she aint moving much, she aint drinking the diesel. BTW the current Cummins KTA's are both 576 HPea and only have 900 hours on them. Hi Kjg, welcome to forum . . If you can afford her, then go for it, as a liveaboard you'll spare the costs of a house and a smaller boat I think, that's if she's meant to be a liveaboard for you . . ? Some sad news, PAR RIP of this thread has gone ahead of us . . Sorry to hear about PAR. His input was very appreciated on this thread. I'll keep this thread informed if I go for her. I have a leaning towards the Diesel Ducks too. Do let us know what you think if you get aboard Morris. Sounds a brilliant idea, living aboard. Are there places along the Tennessee to anchor, or do you already have river front property? I have some choices, however, my wife is suggesting a relocation. Certain TVA lakes along the Tennessee do not allow a liveaboard lifestyle ( just found that out recently). I guess it's doable if one does not get caught. I would rather have it all legal though. Still needing a bit more research. Looking to get aboard soon though to see how feasible the crazy idea is. Thanks for the post. Will let you know. You can always put guns back on her and take a contract patrolling fun places like the coast of Somalia and Columbia.